Photographing single concerts on a tour are hard enough. Add in to the mix unpredictable weather, multiple stages, multiple days, and more bands than you can count, and you have your typical summer festival. Even for one-day festival style tours like Warped Tour and Mayhem Fest in the US, festival photography can be as challenging as it is rewarding. Are you a music photographer? Here's your guide to photographing these annual summertime events to maximize your shooting. First, before we get to all the more photography-oriented aspects of covering a music festival, you still have to prepare for a festival just like any other festival-goer. 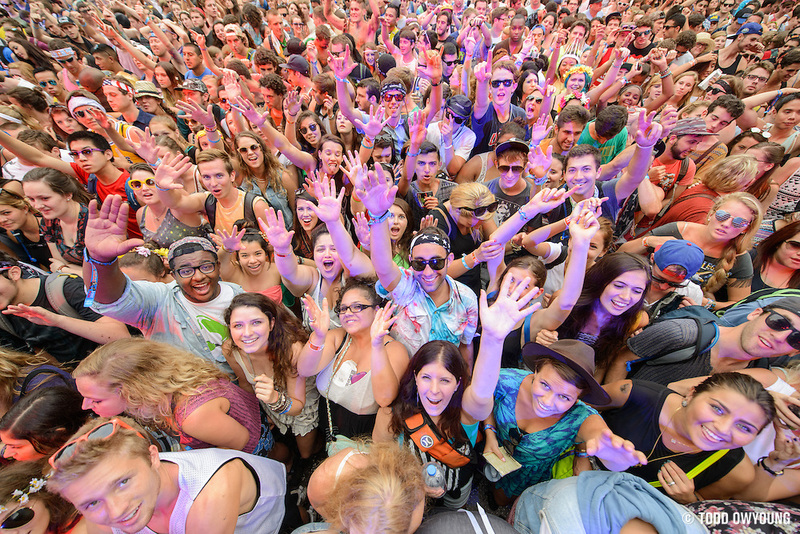 Needless to say, you're probably going to be on your feet for hours and hours at a music festival. Comfortable shoes are a necessity. Both in crowded photo pits and for trekking/running between stages, comfortable footwear is absolutely essential. Leave the flip flops at the beach. A little sugar goes a long way. Don't forget to take some time to eat throughout the day, and, if you can, pack snacks like energy bars so you can fuel up on the go. When photographing music festivals, I always like to plan a schedule of the bands I want to photograph. As with most things, timing is everything with festival photography. The schedules for music festivals are almost always posted at the event, if not well ahead of time. With often dozens of bands performing on any given day, it pays to take a few minutes to plan your angle of attack to maximize efficiency. Start times, the distance between stages, and the anticipated popularity of the bands are the main factors for my planning. The latter point of popularity is especially important if the number of photographers is expected to be limited. Such was the case with Rage Against The Machine performing at Lollapalooza 2008, when only about 20 photographers were admitted to the photo pit out of 100+ shooters. Take-away: Get to the pit early and secure your spot for your must-shoot bands, even if it means skipping other acts. With any extended shooting, pacing yourself is critical, especially if you’re limited on battery power or memory cards. The last thing you want is to be out of juice or card-space at the end of the day comes and the larger bands of the tour are rocking it. If you're constrained by memory cards and aren't downloading on-site to a drive or laptop, my advice is to save a memory card or two for your top-bands. Of course, this advice of pacing goes not only for conserving your memory cards and your camera’s battery, but for your own energy as well. If you have the chance to take some downtime and grab some shade, do it. Taking small breaks may just mean the difference between being able to deliver your best work for the biggest bands and running out of gas before the headliners even take the stage. 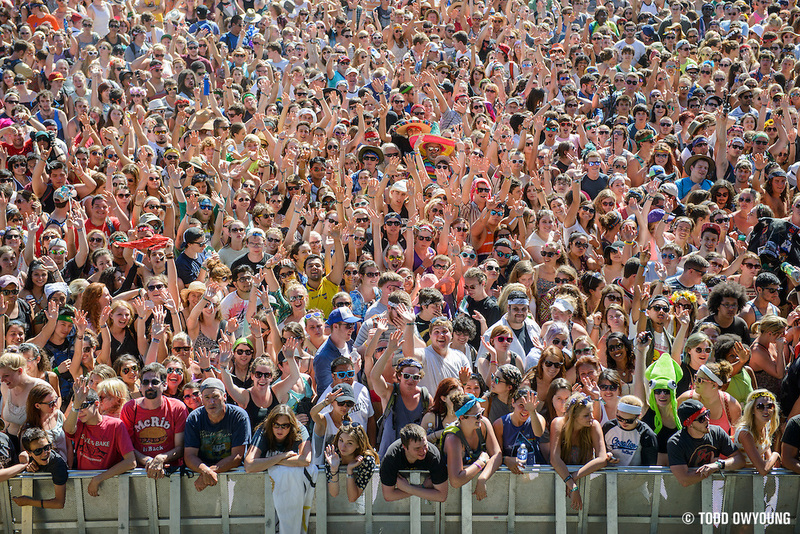 At large music festivals, the photo pits can quickly become crowded, so a little courtesy goes a long way. Basically, the golden rule applies here. Just be nice, because in all likelihood, you’re going to be sharing photo pits with same people all day/weekend long. No eye gouging, no hitting below the waist. In general, best practices mean giving a little common courtesy to your fellow shooters, such as moving toward the back of the pack if you're grabbing “hail mary” overhead shots and not stepping into someone's shot. 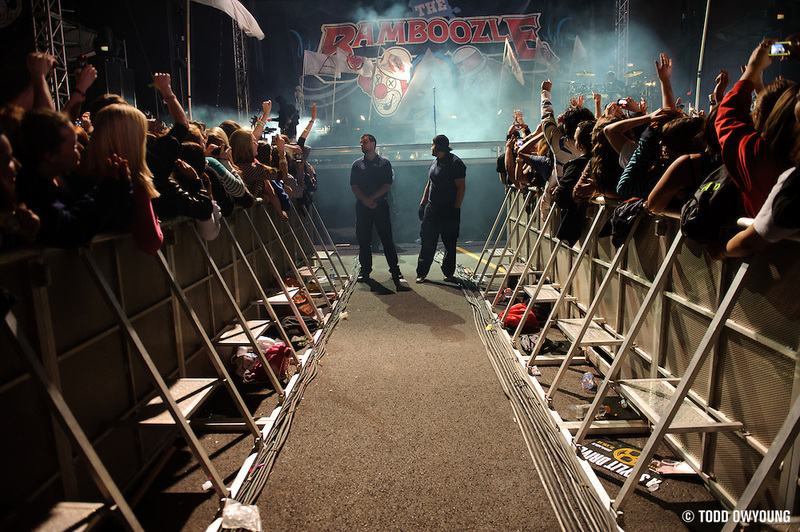 Be sure to check out the Concert Photography Etiquette Guide as well; for festivals, all the same rules still apply. With a multiple full days of shooting, you’re going to want to have your camera’s batteries fully charged before the start of every day. The last thing you want is to have your camera die toward the end of the day, when many of the big guns come out. To conserve battery power, you can minimize image review and shoot conservatively. Better yet, bring an extra battery. Extra batteries are going to be key if you have a power-hungry camera, and especially so if you are going to be reviewing images throughout the day, which quickly drains battery life. When photographing a music festival, image storage is of key importance. Music festivals are the marathons of live music photography, and ample amounts of storage are just as important as having the batteries to power your cameras. Needless to say, a full-day festival is going to require at least 2-4 times as much storage space as your normal 3-band concert, so it's essential to have a game plan for handling on-site storage. Large Capcity Memory Cards: These days, 16GB or 36GB memory cards are relatively cheap. You can grab a 32GB Transcend SD card for about $30, which makes going with large capacity cards pretty much a no-brainer. Even if you don't use all the space allotted by these big cards, having multiple large-gig cards on hand will ensure that you'll have plenty of space every day. Mobile Downloads & Editing: The ability to download on-site to a laptop essentially eliminates all storage concerns. Moreover, the ability to edit throughout the day makes festival work much more efficient, especially when there are daily filing deadlines. The downside to laptops is the added weight and security issues. However, using something like the ultra-portable Apple Macbook Air 11″ is a great option. Aside from a laptop, using a portable drive like a Nexto DI allows one to use smaller cards and download throughout the day, giving the storage benefits of laptop without the option of editing. In-Camera Editing: In-camera editing simply means reviewing images on your camera's LCD screen and deleting on-site. If there's ample downtime between sets, this is a nice option, as it requires no more hardware than what you already have – your camera. What it does require is sufficient total storage of photographer selects for the complete event, enough extra capacity for the last headlining act, and the battery to power extended use of the LCD. The downside to this approach is that you don't have the benefit of a large display for critical editing, so there is a real chance of imprudent decisions and accidental deletions. My general music photography kit includes three zoom lenses: an ultra-wide, a midrange, and a telephoto. Shooting music festivals, this is no exception. One interesting aspect of festivals is that with the exception of the headliners, most of the daytime acts are totally shootable with nothing fancier than a kit lens and slower, variable aperture lenses. That said, I still always recommend f/2.8 zooms, because when the sun goes down and the headliners do come out, those slow lenses will be crippling for normal stage lighting. For the main stages with the headlining acts, a telephoto zoom is going to serve you well at music festivals (I use the Nikon 70-200mm f/2.8). The telephoto's utility for large festivals is in part due to the height of the stages (which can be considerable for events like Coachella or Lollapalooza), but also due of the volume of photographers. Having a telephoto at your disposal lets you shoot from farther back in the pack or from the sides, where it's generally easier to move around and also where you will get a more flattering perspective. For stage-front photography of smaller stages, a midrange zoom like the Nikon 24-70mm f/2.8 or Canon 24-70mm f/2.8 is a great option. Due to the bigger scale of most music festivals, the midrange zoom can serve a “wider” role than it does at smaller shows, and may offer all the wide-angle coverage you need on a full-frame camera. An ultra-wide lens like the Nikon 14-24mm f/2.8 I use is great for capturing the atmosphere of festivals, and especially nice if performers leave the stage and get up close and personal with fans. 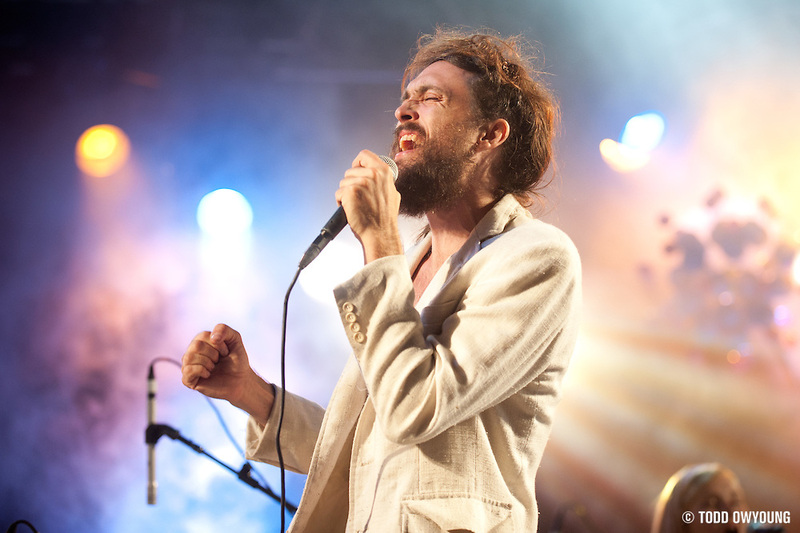 Additionally, wide-angle lenses are fantastic for performers with more theatrical stage productions, like the Flaming Lips or Girl Talk. However, for general live music shooting at festivals, an ultra-wide is going to have limited utility due to the high stages, so keep this in mind when making your festival photography kit. Due to the extra height of large stages at festivals, an ultra-wide angle lens isn't necessary for most kinds of shooting. The exception to this fact is touring festivals like Vans Warped Tour, where the large number of small stages with lower heights can make an ultra-wide lens a great option for performers. Check out my Lens Guide for Concert Photography for more general suggestions on equipment. Want to know what I bring to music festivals? Check out the Gear Guide. 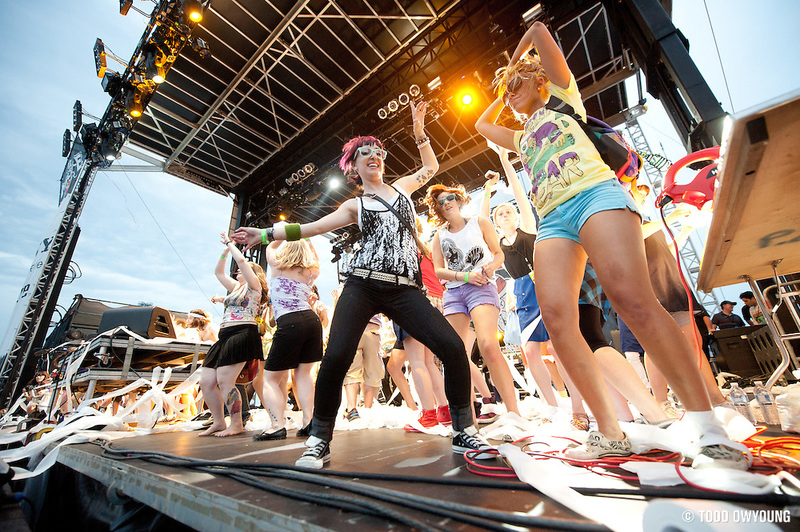 Like most tours, the “first three songs” rule is in effect for music festivals. What this means is that you’ll be able to photograph the first three songs of a band’s performance from the photo pit, located between the stage and the barricade at the front of the crowd. For regular gig photographers, this should be no surprise. For larger tour dates and for popular bands, it’s advised to get to the photo pit early if you want to scope out a prime shooting position. If you get to the stage at the start of the set time, you may well get stuck at the edges of a packed pit. With such packed photo pits, it's simply not practical to move around at festivals as one might at a concert on a national tour. Constant movement is going to be a losing battle in a crowded pit, so one approach is to play “zone defense” and photograph musicians from a single area as opportunities present themselves. 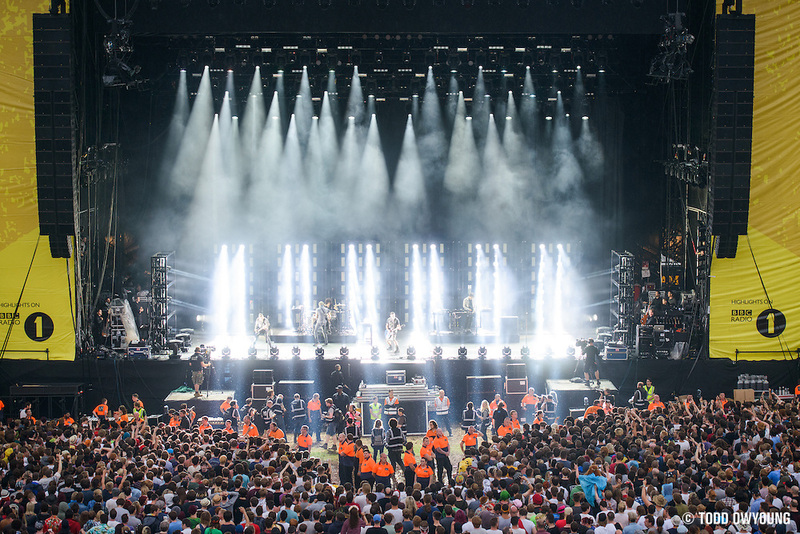 For all-day festivals, most often the majority of the bands play with daylight as the main lightsource, rather than stage lighting. Depending on the orientation of the stages and time of day, open shade can the be dominating treatment for most bands. Pre-setting your white balance for stages that are in shade can help warm up scenes that might otherwise come off as a little cool with auto WB. Using the “Cloudy” daylight preset or manually dialing in a K rating of between 5000-7000 should work in most instances. This small trick can be enough to keep performers under shaded stages from looking too blue. In addition, having a set WB can also make processing easier and more consistent. If you're photographing a music festival, have fun. I hope these tips and suggestions have helped. 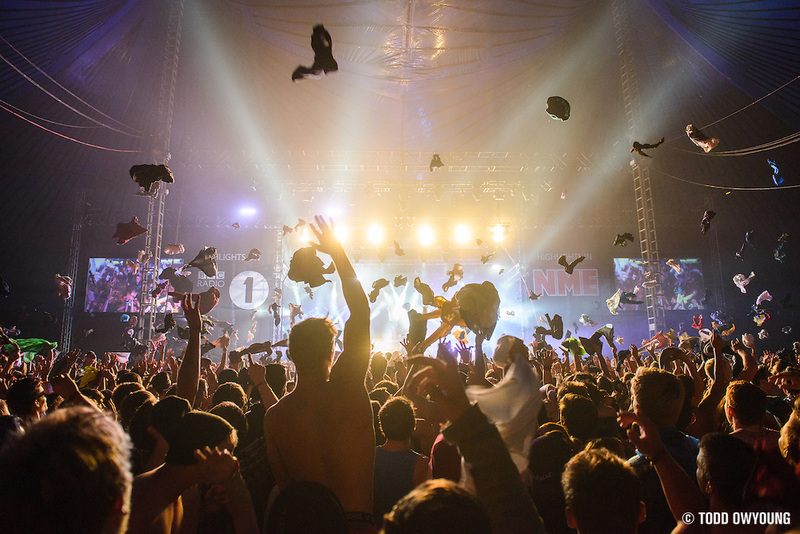 Oh – and one last thing: If you happen to be shooting Glastonbury, bring your Wellies. This year is my first big festival, Summerfest in Milwaukee. Thanks for the helpful tips! Summerfest is a big one. That’s quite a first festival. Have fun. from time to time o surf your page..is nice to see some good work and catch some tips. Happy to do it. Thanks for the comment, Fabian. This is a must read if you plan to shoot Summerfest or Harley Davidsons 110th this year in Milwaukee. Message me if you need and local info. Thanks so much for putting this up! 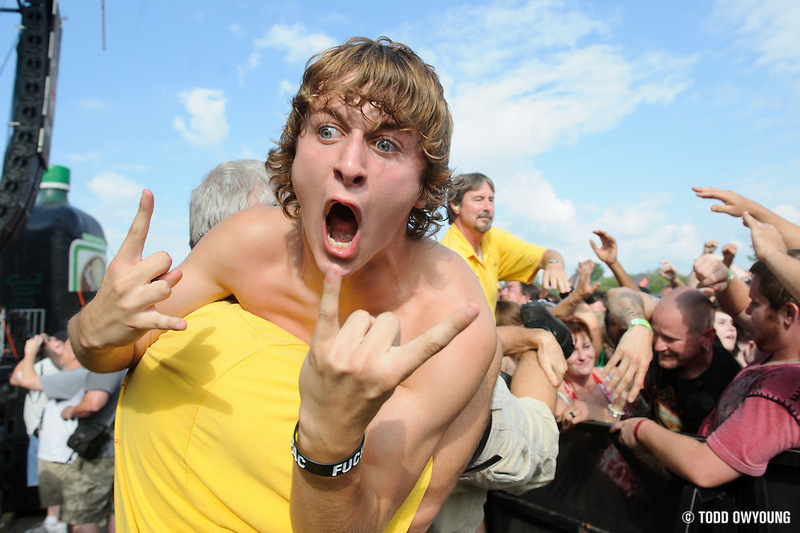 Unless I’m mistaken, this is an updated version of your guide to shooting Warped Tour, which I have had bookmarked for quite a while now, as I’m hoping I get cleared to photograph Warped Tour in Chicago this year. If I get to shoot, it will be my first festival ever, so to get an update to the guide is extremely helpful! I do have a question: since this post is more geared towards people like me, who are just starting out, and most of the people in that demographic would probably be more likely to have crop=sensor cameras rather than full-frame beasts, what lenses would you recommend to those of us shooting on DX bodies? Thanks for the great article. I shot Punk Rock Bowling this year for my first festival show. I am shooting Warped Tour in Utah, Riot Fest in Chicago and possibly Denver later this year. I love your work hope to be up your level one day. Getting access is always the hardest part. One more thing to remember for festival shooting. Find a comfortable way for lens changing. I mean Your “photobag strategy”. What bag to use? 2 cameras are good, but think of a weight and attachment for a long day (2x full frame body). I’ve tried both and found shoulder reporter-bag/ 1 body) the most suitable option, where I can slip in my notebook aswell. Sure You’ll get some dust on sensor by switching lenses often, but You don’t use closed aperature in concerts anyway. About lenses I agree with Todd. Though, not sure to have 14-24/2,8 mm or Nikon fisheye instead for wide angle shots. The importance of friendliness and courtesy cannot be overstated. Be nice to everyone — bands, the people with the bands, the audience, the organizers of the concert, and the light and sound people. Leave your ego at home. Thanks Todd for your inspiring article that came out from your experiences in years. I really need this article to built and ensure my job in yearly music festival working well, this is due to the fact my first photo coverage for the biggest gigs in my country Indonesia, it calls Java Rockinland, however I regularly take gigs photography but never been on the big stage, but once again you reminding me through the article about the manner when shooting and being nice with everyone, sometime we (the photographers) can ‘punching’ each other while defending their zone. I always switch on my ‘spiderman-sense’ mode too. Thanks for the tips and info. I’m shooting my first festival tonight and hoping I can do a good job. I always go to your site for concert photography tips, again thank you Todd. I’m going to Tomorrowland in Boom, Belgium. Great tips! This Wednesday (July 17th) will be my first big break for my photography. I’ll be covering Warped Tour in Pittsburgh, get to see my favorite band and photograph them and hang out with Hawthorne Heights. I’ll just have to make sure I get to the pit early for Black veil Brides. This is by far the most challenging step. Great article! Thanks so much! I’m photographing Harvest Music Festival in Ozark, Arkansas in a few weeks – this was a helpful review! Do you have any tips for combating the red stage lighting? It kills my photographs! Red stage lighting photos make excellent black and white’s! I was there in the crowd of RATM during Lolla 08, I can’t imagine what it was like being on the other side! After you shoot a music festival, are there any sources that you can submit your photos to? I’m looking to gain a little exposure on the photos I took, rather than just throwing them in the portfolio. Thank you Todd for all the great info on your site!